The Curves adjustment is one of Photoshop’s most powerful and versatile methods for changing tonality in photos. Use this tool to adjust photos so that they match the style of your overall design. Perhaps you’ve seen the Curves palette in Photoshop and said to yourself, “I wonder what that does.” It’s not just professional photographers that can benefit from the Curves tool. In addition to its complicated usage in post-production, it can be very useful for designers, too. Designers are frequently tasked with using photography that clashes with the style, or aesthetic, of our projects. So, one of the most important tools a Designer can have in their toolbox is the ability to alter tonality of images in order to match existing design work. 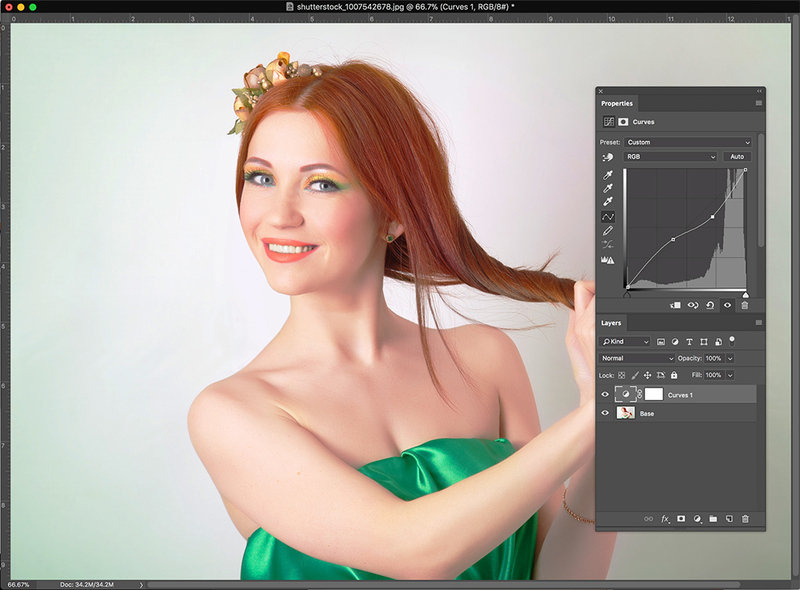 One of the greatest developments in Photoshop is the addition of Adjustment Layers. These allow us to use a great variety of effects without permanently committing them to a file. In other words, these are effects that sit on top of layers. You can turn them on and off like a regular layer, and they can be deleted or adjusted without permanently altering the original file. If you use a Curves Adjustment Layer and you save the file, you can come back and adjust it any time. To add a Curves Adjustment Layer, select the layer you want to adjust, the click the Create New Fill or Adjustment Layer icon at the bottom of the Layers palette. Choose Curves from the list. The settings will show up in the Properties window. Tip: It’s a good idea to keep Layers and Properties grouped in a stack, seen below. Photoshop gives us some preset values to use within the Curves palette. This can give us a feel for how different vector points will be affected on the path. It also gives us an easy way to punch up or tone down the intensity of colors in our images. Below are examples of some of the presets that generally give good results on images of people, plus one that looks crazy applied to this photograph, for comparison. We can use this preset graph to see that a point added in the middle of the path, then moved higher will increase brightness in a soft way. The opposite is true for darkening – if we pull down on a point in the middle of the graph we get a soft darkening of the photo. This is handy to remember for later. We can see from some of the Contrast presets that multiple points that make an S-curve increase or decrease both brightness and contrast. Not all presets will work for every photo. Cross Process uses settings on the individual RBG color channels for its effect. It can be handy preset for making a photo look vintage or faded, as on the right-side of this image. Now we see that the shape of the line determines how the color info is changed. A simple sag or bump on one point in the middle of the graph shifts the brightness in a pleasingly soft way. An S-curve treats the color information in more dramatic ways by adjusting contrast as well as brightness and darkness on a tighter curve. Let’s try to add some manual graph points and shapes to see how they affect the image. For a more dramatic lightening or darkening, as well as contrast shifts, let’s use the sliders at the bottom of the graph. Notice how using the dark slider on the left drags a point at the very bottom of the graph to intensify the darks. Conversely, the light slider on the right drags a point at the very top to increase the lights. Use these to create dramatic shifts in color or tone. Above we saw that dragging down a mid-point on the graph increases or decreases brightness and contrast in a soft way. Simply click in the middle of the line on the graph and pull down or push up while observing the changes on the image. Up brightens, down darkens. Using points to create S-curves on the graph adjusts the grays in an image. This can be handy on a contrasty image, since it will enhance the middle tones. Create more specific adjustments using multiple points. By adding a point in the lower portion of the line and bringing it up slightly, we can subtly increase shadow tones without increasing the darkest tones. This can help bring out details that may be too dark. Adding a second point in the upper part of the line, then dragging down a little bit reduces the lighter grays bringing a soft tonal balance without affecting the top-end brightness too much. Enjoy your new tool and use it wisely. As we can see from these examples you can definitely go too far. Use judgement and the aesthetic of your projects to determine how far to push or how much to pull back on the controls. And remember… Use adjustment layers. Find stunning vectors and take your designs further.